Getting married on the Amalfi Coast is a unique and unforgettable experience, where beauty is exalted in refined ‘Made in Italy’ style and the beauty of the landscape combines with the delicious food taste and unique Italian lifestyle of this enchanting area. That’s why we believe that an exclusive wedding is not always a question of budget but of refinement, elegance and distinction. Style, beauty and luxury is the perfect connection for your wedding in a luxury hotel in Amalfi Coast. Choose from our unique Luxury wedding venues in Amalfi Coast, and our staff will advise you according to your needs and expectations, the perfect setting, for your wedding in Italy. Nothing will be left to chance; the most important day of your life deserves the best wedding location. An original Art Nouveau maritime villa set in the natural beauty of the Amalfi. an incomparable venue ideal for both small banquets and sumptuous wedding reception. Close your eyes and imagine get married in an Arab-Norman Cloisters of the XIII century ; or in splendid Chapel of an ancient Convent and eat in on the Monks’ Walk terrace overlooking Amalfi. In the wonderful frame of Ravello, the high class luxury Hotel Caruso in Ravello is among one of Italy’s most elegant Wedding destinations. Palazzo Avino is an ancient noble 12th century villa, offeringa stunning sea view on Amalfi Coast and an unparalleled view of the Gulf. 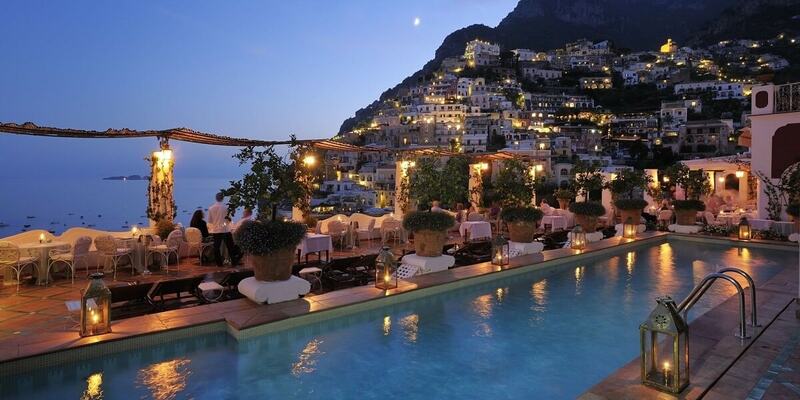 Located in the heart of Positano, offering enchanting views of the village and picturesque bay, is a magical setting for a romantic wedding in Amalfi Coast. The first historical hotel in Ravello, still conserves a suggestion of the medieval structure with architectural and decorative elements added later in the 17th century.